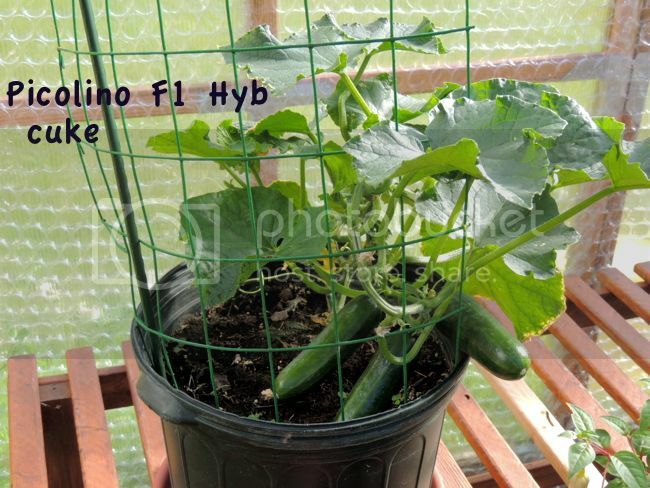 I grow Picolino F1 hyb in pots so I can have early salad cucumbers before the other in-ground cukes get going. It's a baby English type like you get in 6 pks at the store. Wouldn't be that useful if what you are needing is a lot of pickling type cukes, but it sets very well and they grow to eating size quickly. The seeds are a bit expensive, but I haven't had any trouble with germination, and I only grow a couple each season for earlies. I have been wanting to grow something like that. I know some vines can be cloned, is this one of them? Big Tomato Fan, mostly grow Tomatoes from cuttings, all Tomatoes are grown in Coco Coir/Grow stone. I love Air Pruning. Every flower is a cucumber. Potassium bicarbonate works 100% on PM. I used it last year once and never anymore PM. Just spray everything heavily and everything around to get all spores. I was pleasantly surprised to see that 3 of the 16 Picolino Hyb seeds had popped up in 5 days, beating out most of the other cucumbers I started in cells - Salt and Pepper had one seedling up. Now to see if they are anything like the F1. It's certainly possible that my seed cucumber was also pollinated by other cukes about 25 ft away, so this will be a fun grow out with no fixed expectations. But I'm hoping for a short and early. I have tried a few cucumber varieties and Sweet Success has also been the best one for me. They sell starts of this variety at most garden centers around here. So this year I’m going to try a couple of other parthenocarpic varieties from seed, Roxynante F1 and Socrates F1. I hope they are worth it at $1.50-1.80 per seed. If anyone has grown them please do share your experience. Here’s a picture of Swet Success from my garden.